Parth crafts is leading supplier and manufacture of fancy baskeet like MDF basket, wooden basket, metal basket in different shape and size. Our company is highly esteemed firm known for offering Dry Fruit Basket to the clients. This product is available in square shape and other shapes with different compartments to keep different varieties of dry fruits. Dry Fruit Basket is checked under the guidance of professionals on various quality parameters. 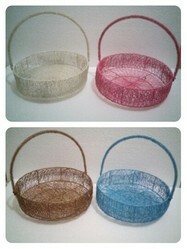 we are manufacturer of Wedding Metal Basket. 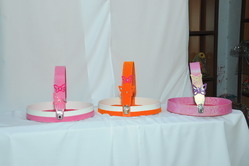 These are available in different size and design. Backed by rich industry experiences, we are highly engaged in offering a premium quality range of Designer Wooden Basket. We are one of the well-known manufacturers, suppliers and traders of Fancy Basket. 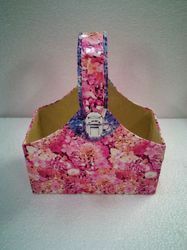 The offered fancy baskets are very fashionably designed for gift purposes. Our supplied fancy baskets are very stylish and trendy, which can be used to pack the gift items, during festivals and celebrating occasions. The offered fancy baskets are available in multiple sizes and shapes, which are very intricately decorated and designed. Our firm is dealing in the manufacture, supply and trade of Fancy Basket. The offered basket is made by joining wood pieces, which are very elegantly decorated. Our supplied basket is very durable and strong, owing to the hard wood frame. 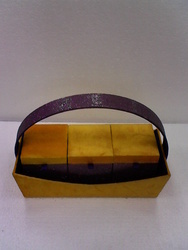 The offered basket is constructed, very sturdily, for packaging of the edible and general gift items. Our offered basket is an eco-friendly construction, owing to the biodegradable wooden parts. We are one of the well-known manufacturers, suppliers and traders of Latherate Basket. 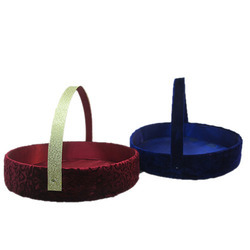 The offered latherate baskets are very beautifully designed, for gifting flowers on marriage and festive occasions. 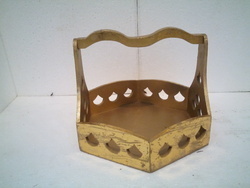 Our offered latherate basket is very stylish and lovely in looks. The offered latherate baskets are suitable for flower gifting on all happy occasions in family and societies. Our offered latherate baskets are very cost effective in rates. We have been dealing in the manufacture, supply and trade of Latherate Basket. The offered basket is very elegantly designed and decorated, for use on festivals and social occasions. Our supplied baskets are highly acclaimed for the strong framework and intricate decoration. The offered baskets are very stylish, owing to the lovely designs and beautiful decoration. Our offered baskets are made in sync with the latest trends and patterns. We are an acclaimed name engaged in offering our precious clients a superior quality range of Confectionery Basket. These trays are manufactured using optimum grade raw material and sophisticated technology in synchronization with international standards. 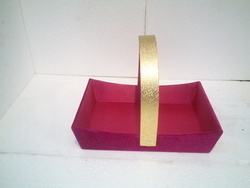 Further, in order to meet the style and the demand of the customers, we provide these trays in elegant design and shapes. We offer these trays as per the requirements of the customers at reasonable prices.